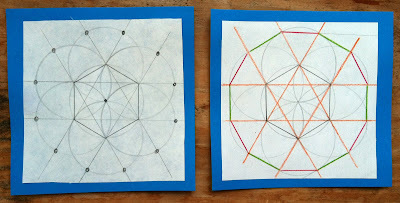 I was recently inspired by Paul Salomon's thinking about stars and mathematics. From our conversations I am excited about trying to understand stars better myself, and also about what they might have to offer in terms of elementary math explorations with my seven year old daughter. Paul mentioned to me that stars have connections not only to geometry, but also to number theory and group theory (a branch of modern abstract algebra). The visual interest provided by different kinds of stars is really what pulled me and my daughter in, with both of us wondering aloud: What's going on there? I started my inquiry last night by constructing a bunch of different 12 stars. Sure I could have gone straight to the cool star applet Paul recommended, but I somehow found myself drawn to the classic geometer tools: pencil, straightedge and compass. 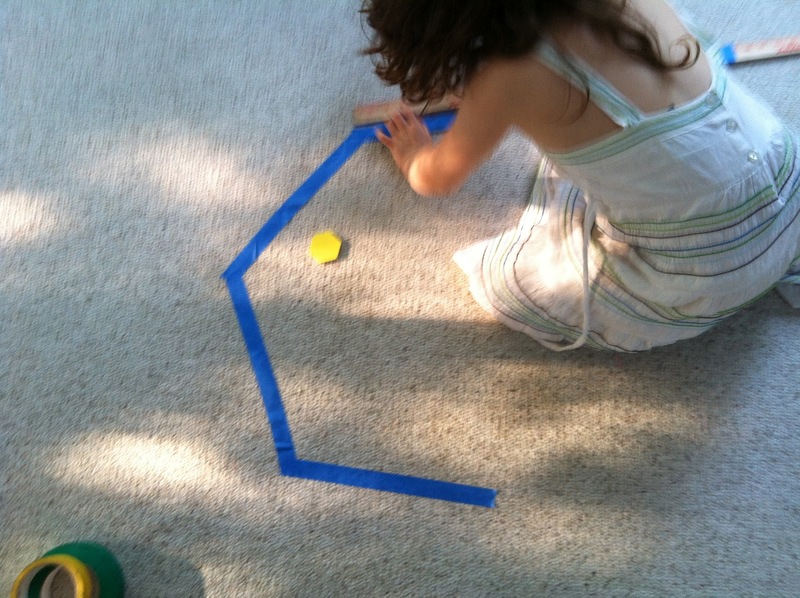 I wasn't sure how far I'd get, but I wanted to at least understand how a dodecagon (twelve sided polygon) was constructed so my kid and I could make one using floor tape in the morning. ...and that's as far as the book illustration got me. Then, looking at a photo of twelve pointed stars Paul had designed and cut out of plexiglass (I ordered my own set, it's coming soon!) I tried drafting my own versions. Using the basic framework for the dodecagon I made two stars -- one made of two hexagons, the other out of three squares. It looks pretty straight forward, but at one point I really struggled with how to create the points of both stars -- you can see erroneous red lines in both pictures. And here are two more stars, below; one made from four triangles, and another from a six line asterisk. There was one more that I couldn't figure out, but I was still pretty satisfied with my efforts. My lingering confusion is the system and language Paul uses to classify stars; his notation looks vaguely like Cartesian coordinates. I've read over his explanations to me, but I really wish he were across a table from me illustrating it in real life. What I notice in the picture above, for example, is that the green side of a square intersects with two points, one on either side of the red and orange points. I see it but I don't know how to talk about it yet. I did all that last night. This morning I really wanted to see if we could at least tape down a hexagon on the floor. Despite the fact that many of my posts seem like my kid and I are in some sort of harmonious learning nirvana, she is actually sometimes quite a resistant learner which was the case today -- she really wanted nothing to do with me and my math. She was measuring, taping and cutting as she went and was doing an excellent job at eyeing the angles. Her fourth angle was a little too big, so I pulled in a hexagon from our pattern block set to show her how to use it to make each interior angle the same. Resistance flared again, but I had the immutable laws of geometry on my side. 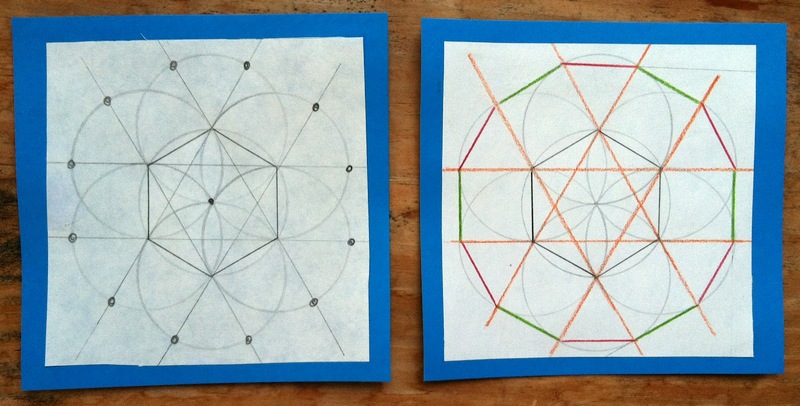 "Well," said I, "it won't really be a hexagon unless all the inside angles are the same." Silence. I sat quietly by after that and at some point I noticed she had taken the yardstick to make sure all the sides were the same length. I heard her mutter something about "...these two are thirteen inches..." and then I saw she had decided to trim them. Her hexagon is below -- pretty good! Then she made sure to let me know she was making a square around it so no one would touch it. It was hers, not the math mommy's. She even went so far to install a burglar alarm in the form of percussion instruments so she would know if someone crossed over the line. Given the mood around here today, I'm pretty happy with what got accomplished. She did a bunch of independently initiated measuring (length and angles), and applied her understanding of equal sides in an analysis of the hexagon she created. And all of that pretty much without me. Later, when we were out and about, she applied the activity to other areas of her life. One moment found her running up the zig-zaggy library ramp to the exit and exclaiming: "All you have to do is move your feet at an angle and you can run really fast up the ramp!" In a restroom she saw that the sink's drain were made of small circular holes that formed a hexagon, and congratulated herself that she wasn't calling it an octagon anymore. I think I'll let it sit for a while, maybe long enough to order some more floor tape in a huge amount of colors. Perhaps a pile of new tape and some scissors left lying around will be enough to inspire a more collegial attitude around here! Ah, yes...resistance. In my house it's called a hissy fit. Does your kiddo have any specific triggers for her resistance? I have one kiddo who throws a fit if she makes an error, and another kid who throws a fit as her way of telling me that she doesn't understand something. 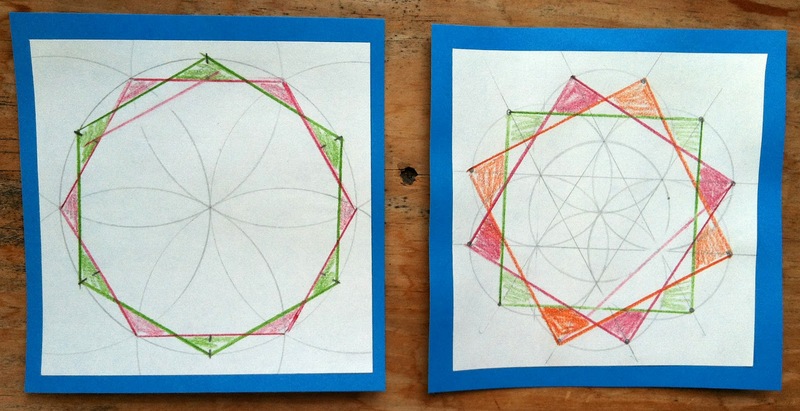 "it won't really be a hexagon unless all the inside angles are the same." Actually, hexagon just means 6 sides, so it is a hexagon even if the angles are different. A regular hexagon has all angles the same and all sides the same. Seems like elementary geometry is all about regular polygons and polyhedra which, I'm just now realizing, is why Platonic solids are introduced first. 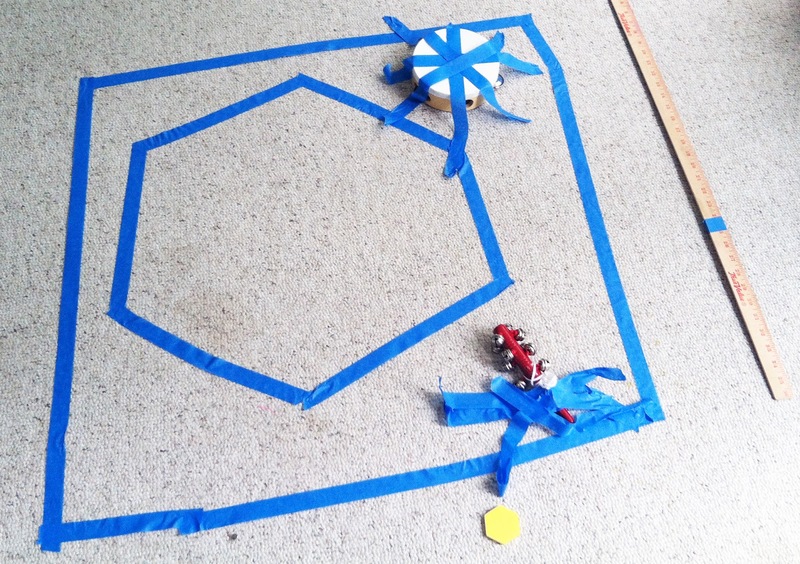 Once a kid can identify regular polygons constantly, why not introduce other examples? In the same vein, I saw a building kit for making Archimedean solids which I'm drooling over -- it's for grades 6-12, but why wait? We don't need to do it 'right', we can just explore and maybe even discover the truths on our own. I love geometry so much and I'm on a mission to find out how much other math (especially number reasoning) I can teach using geometry as the starting point. Julie, a little bit of both (especially with reasoning games and puzzles, like mastermind, or when she feels rushed) but it's more about a very independent learner who wants to figure things out for herself in her own time. Fair enough. I wouldn't really call her reaction/resistance a fit, it's more like a big wall slamming down. I bought a little flower-shaped pocket mirror for my girl. Asked her how many petals around the edge (12) and we made the connection to the new plexiglass dodecagons we got in the mail from Paul Salomon today. She said, "Well, this is an irregular dodecagon..." It was a great opportunity to talk about what irregular means in math and what it doesn't. Crazy that it came up the same day you left your comment! I love that kind of serendipity. It sounds like she was using the word irregular to mean unusual, which is a fine meaning. But of course the math folks have given it a particular meaning.